Vito Russo (July 11, 1946 – November 7, 1990), was a visionary, a humanitarian, an evangelist and a activist. Everyone who met him became part of his campaign group, whether that campaign was about LGBT rights or about the provision of medical aid to cover AIDS in the USA during the time of the Regan administration. He was a writer, a historian, and an acclaimed presenter on ‘The Celluloid Closet’; he travelled the length and breath of the USA educating and trying to galvanize people into fighting for their rights and to stand up for themselves. He was in the forefront of the battle to get the US administration to invest in developing a medical solution to AIDS and also in the provision of support for those suffering from this disease – President Reagan did not recognise the LGBT lifestyle, and through his direction the administration did nothing to help those suffering from ‘the gay plague’. Indeed Vito’s partner later developed AIDS, as did he himself some years after Jeff’s death. Vito was a great orator, who had the ability to bring people from all walks of life on board to the campaigns – gay straight, black, white, red – the ordinary man and woman on the street to high profile stars like Liz Tayle or Lily Tonlinson – and through this ability society recognised the injustice of the administration’s stand and practice. Vito was born in New York City , and grew up in East Harlem, graduating from New York Universityand died in 1990, having been in slow decline due to AIDS for some years. The LGBT community, indeed a much wider community than this, came out for his funeral and expressed their feelings at the loss of his life – his life stands out for those who have listened to him speak, watched him campaign and read his writings; indeed he is comparable to Martin Luther, Ghandi and others who stood up and fought injustice I believe. I would urge you to make the time and find his book, watch him on YouTube and read about his life – become inspired to fight injustice no matter where you see it – your life will be enriched and so will society’s. In the campaign to expose the appalling enslavement and exploitation of Congo natives by King Leopold II of Belgium, the names of two great humanitarians, Roger Casement (the 150th anniversary of whose birth occurred this year) and ED Morel, deservedly stand out. Now, thanks to the researches of Óli Jacobsen, a third name may be added – that of a humble Faroese missionary called Daniel J Danielsen. Óli Jacobsen’s book on his fellow Faroese national has just been published and, to mark the occasion, the Faroese government has issued a stamp with pictures of both Danielsen and Casement. Adam Hochschild, the author of King Leopold’s Ghost, has described the book as doing “a fascinating job of restoring a previously forgotten man to his rightful place in the 20th century’s first great humanitarian crusade”. Danielsen is remembered today, if at all, in the Faroes as one of the very early evangelists of the Plymouth Brethren movement there. He was also the first Faroese to serve as a missionary outside the islands, when he worked for the Congo Balolo Mission from 1901 to 1903. Óli Jacobsen had been writing short biographies of significant Faroese personalities when he decided to investigate Danielsen’s story. 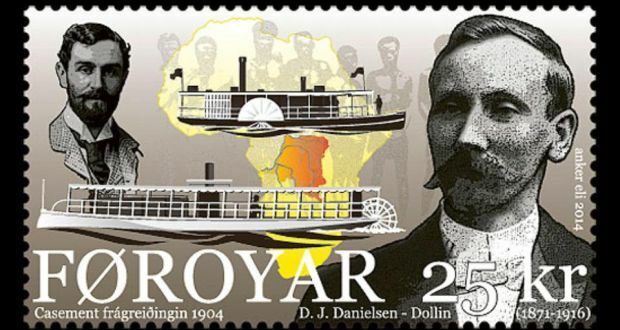 He had no expectation of finding anything of consequence to any history beyond that of the Faroes, so it came as a surprise to him to discover Danielsen’s significant contribution to Roger Casement’s investigation into conditions in the Belgian Congo on behalf of the British government. ED Morel had been running a sustained writing campaign in Britain about the way natives of the Congo Free State were being treated, his information coming from British, American and Scandinavian missionaries, among others. Eventually the issue was taken up in parliament and the result of the debate was that Casement, the British consul in the Congo region, was sent to investigate the allegations. In order to carry out an adequate investigation, Casement needed to be able to travel freely in the area but, hardly surprisingly, the Belgian authorities were not altogether willing to cooperate. He had to find an independent means of transport, especially to be able to travel up the Congo river to visit some of the more remote villages. He had already established contact with Protestant English-speaking missionaries and eventually succeeded in hiring a steamer, the SS Henry Reed, from the American Baptist Missionary Union. The steamer was not in great working order and he was fortunate to meet and persuade Danielsen, who was an engineer, to accompany him on his journey. As well as acknowledging Danielsen’s invaluable help, Casement was writing to Lord Lansdowne to explain that he had refused to accept any remuneration whatsoever and to ask his superior to authorise him to make a modest donation to the Congo Balolo Mission, for which Danielsen worked. Brutal flogging, the cutting off of hands and the taking of women hostage for the good behaviour of their menfolk were some of the barbaric practices perpetrated upon exploited Congo natives that Casement heard about, witnessed the results of and wrote about in his report, which caused a sensation when it was published and proved to be a turning point in the campaign to put an end to such atrocities. Danielsen took some shocking photographs while accompanying Casement. Óli Jacobsen argues that these were of great importance in the public campaign that followed in Britain, because it was the first time an account of an atrocity could be illustrated so clearly to the public. Danielsen afterwards used the photos in lantern-slide shows at public lectures he gave as he campaigned to end the barbarities being inflicted on innocent natives in the Belgian colony of the Congo Free State.